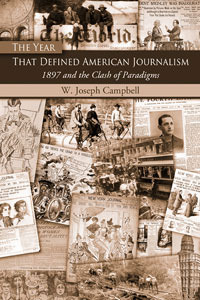 "The Great Press War of 1897"
Press scholar W. Joseph Campbell recently voyaged to the late 19th century and has returned with a brilliant new book that pegs 1897 as the exceptional year in which "the contours and ethos of American journalism began to take shape." "This book offers a different and well-documented perspective of the Yellow Journalism era... In so doing, [it] makes a significant contribution to our understanding of journalism history and, ultimately, the journalism of today. "This is a lively and fascinating book, beautifully written and thoroughly researched. It effectively captures the American fin-de-siècle, providing a snap-shot yet admirably conveying the dynamism and anxieties of the period. His name was W. Joseph Campbell, and he wrote "The Year that Defined American Journalism: 1897 and the Clash of Paradigms," a book about events and trends in that year that caused big changes in the ways newspaper staffs went about their craft. In his chat, he made so many parallels to the changes in journalism right now, it made me feel that the business will emerge intact. Different, maybe, but hopefully stronger than ever.